Easel Pics are our very own creation. This is a delightful little product, and it is the perfect gift idea. 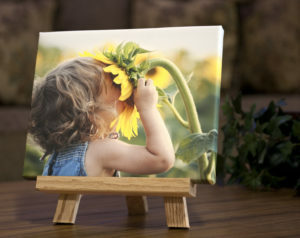 We print your very favorite photo on to our high quality, water-resistant canvas. It then has a double lamination added to it for protection. Now it’s safe from UV light, dust & dirt, spills, and fingerprints. It is also very easy to clean. Just dust it, and if more is needed, simply gently wipe it with a damp cloth. 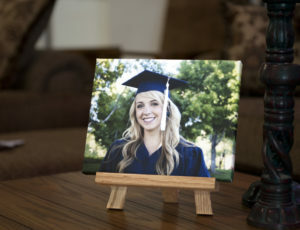 Your canvas picture is then wrapped around a custom-cut MDF block in either 8×10 or 11×14. We also do most any custom size if needed. That finished canvas covered block will be placed on an oak easel, all hand-made in our own wood shop. The easel has no screws or chains. It’s cleanly made, very neat, and ready to hold and display your precious picture for many years to come. #1. And it looks so great! And the little easel stand is a great touch! Thank you so much for all your help. We will definitely recommend and use your business again. #2. Upon receipt of 2 “Easel Pics”, a customer from Kentucky stated, “They melted my heart.” Autumn That says it all. 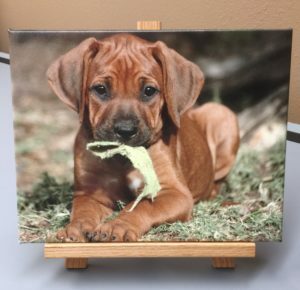 Please stop in (101 W. Elm * Gaston, IN* 47342), call us (765-358-3144), or email us (info@shutterbugprints.com), and let us get started on this very unique product for you. Just think of all the holidays upcoming, and this is the absolute, most perfect gift for any/all of them.